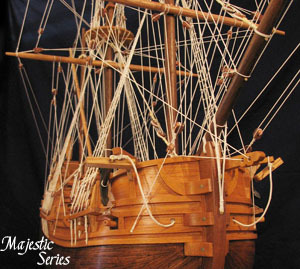 John's ship art creations are a blend of artistic expression and historic representation. Each and every piece is its own unique romantic representation of a ship from ancient times that is hand crafted from North American, South American and African hardwoods such as oak, ash, poplar, birch, mahogany, walnut, rosewood, padauk, purpleheart, redheart, dubingo, blood wood, or/and other hardwoods. Rigging lines are made from extremely strong, woven nylon/cotton cord or from brass rods. Pulleys are all individually hand carved from wood or created from brass tubing. All ship art is sealed with multiple coats of a polyurethane "frost" textured, clear satin finish to reduce glare and mitigate the visual effect of dust build up. Each piece of ship art comes from an original design developed by the artist, and no two ships are ever exactly the same. Some ship designs are truly "one-of-a-kind" creations. Others designs may be used up to 20 times, but with each piece slightly different in some way. The artist utilizes historic drawings, paintings and, in some cases, architectural plans to help create the basic forms of the hulls and rigging, but the details of each ship are left to the artist's imagination. These ships are available nowhere else in the world except from John R. Benedict. John's ships are not intended to be true historic replicas of any particular ship, but rather artistic representatives of particular types of ships from naval history. If you are looking for historically accurate scale model ships of certain ships, you must look elsewhere. If you are looking for extremely high quality "ship art", then you are at the right place. Do You Want A Ship? John creates three different types of ship art series: the Medallion Series, Fantasy Series, and Majestic Series: each offering a notable difference in the level of detail and artistic expression. 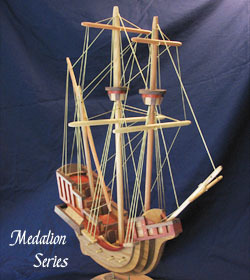 Generally, Medallion Series ships are made for sale throughout retail stores, art/craft shows or by special order from this website. A number of Medallion Series ships are shown on the website. Production of Medallion Series ships will take from 3 to 4 weeks. If John has completed a new Fantasy or Majestic Series ship, it will be premiered on this website. John R. Benedict will accept bank cashier checks, or credit/debit cards for ship art. Ship art pieces shall be packaged and shipped as soon as submitted checks or credit/debit cards clear affected banking institutions. The Medallion Series design concepts come from the fanciful images of ships represented on ancient stone relief carvings, and on maritime administrative seals and medallions. Dimensional elevations for the hulls are left in place with little or no carving to produce a "layered effect." Details on the hull and rigging are extremely simplified or lacking. All rigging is made from brass rods and/or tubing. BEGINNING IN 2008, ALL MEDALLION SERIES SHIPS COME WITH FULLY BILLOWED, ANTIQUED (HEAT TREATED) COPPER SAILS. Medallion Series ships can cost between $250 and $2,000, with the typical ship being $250 to $550. 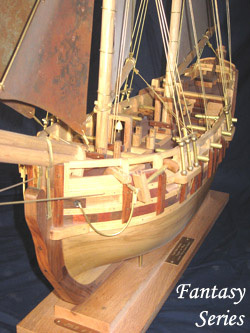 Though the Fantasy Series and Majestic Series ship art pieces are designed to have more historically representative hulls, John accentuates the ships' trim work, deck detail (such as cannons), and rigging by exaggerating its size while at the same time simplifying its detail so as to make it more visible from long viewing distances. Because of hundreds to thousands of hours required to make each ship model by hand from high quality raw materials, John shall make very few of these ship models in his lifetime. Because of the time required to complete them, Fantasy and Majestic Series ships can cost thousands of dollars. Copyright © 2005-2019, Benedict Arts, All rights reserved.